Many years ago my sister had this cute little bistro table and chairs on her patio and I loved it. When the table top broke she decided to get a larger patio table and get rid of the old set. I took the set with grand plans to make a mosaic top for the table – but like many of my great ideas it just never happened. My husband was getting crabby about the useless table and tried to talk me into getting rid of it. Luckily I came up with a new and even better idea, a planter! 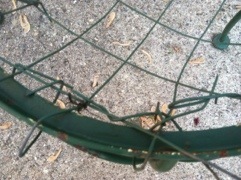 I had a roll of wire garden fencing and decided to use it to make my planter. 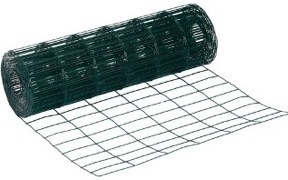 I bent the ends of the wire fencing around the metal frame of the table on one side then bent it into a bowl shape and bent the ends around the other side of the table frame. I took another piece of the wire fencing and laid it cross wise over the first piece and wrapped the ends around the table frame. 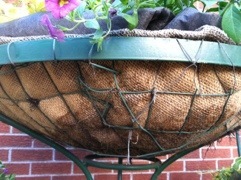 I lined the wire bowl with burlap and then I added a couple layers of landscaping fabric. I removed the seat cushions from the chairs, I only needed one layer of wire fencing, then the burlap and landscape fabric for each chair. I filled them with potting soil and flowers and was delighted with how it looked! That was about 10 years ago and the table and chairs are still my most favorite thing in my yard! 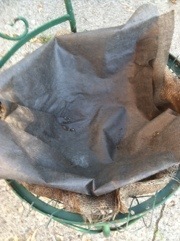 Since then I have had to redo the burlap a few times and replace the potting soil – but it still looks great. I have added a couple perennials: a hosta plant and some creeping jenny, so there is something growing almost all year. 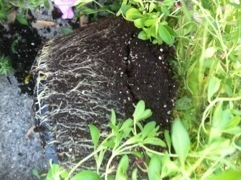 Sometimes in the spring I plant pansies, then for summer I replace those with annuals, then for fall I add some mums. 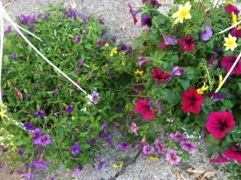 I was shopping today and I found a couple of cheap hanging flower baskets — I have found that these can be a great bargain after Mothers Day! 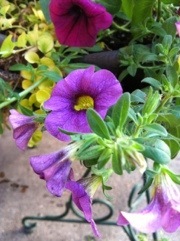 The baskets usually have 3 – 10 plants in them and end up being a much better price than buying the plants individually. These planters were becoming root bound and really needed to be divided. I ended up with enough plants for the table, chairs and another pot as well! 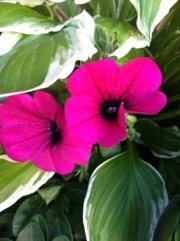 It will take few weeks for them to recover and fill out but they already look pretty good. By mid summer the plants will be trailing over the sides of the table like a tablecloth! Best of all it was cheap and it is still my most favorite garden project! Love it! What a great idea:). 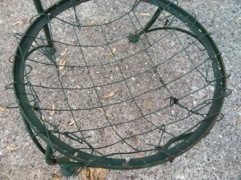 I’ll be keeping my eye out for a bistro set as I make my rounds at garage sales! Thanks Judy! I just saw a similar set at a garage sale last weekend – I almost bought it but I was with my mom and she talked me out it. The next day I was filled with garage sale regret because I hadn’t bought it – I hate that feeling! Oh me too! Not everyone gets the art of thrifting:). I have learned to trust my gut when shopping. I know pretty well when something is a great find. The challenge is just finding time to do the repurposing! I love this idea, I will also be on the lookout for a used bistro set.